“What do you call someone who can speak only one language? An American.” This is a typical joke usually told by people outside of the United States. Well, there is at least one American I know who wouldn’t fall under this stereotypical impression. He is undoubtedly one of the most prominent Kurdish linguists of our time and he knows it. The only problem is that he doesn’t brag about it – but I think he should. It’s Michael L. Chyet, if you are still wondering who I’m talking about. 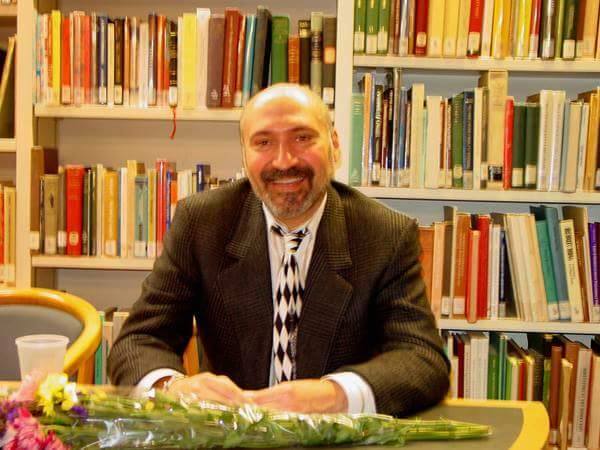 Born to Jewish parents in 1957 in Cincinnati, Ohio, Chyet developed an exceptional affection for languages and cultures. Michael’s father, Stanley Chyet, was a well-known historian and poet whose poems were published in English and Hebrew. Michael was only 6 when he was sent to a Jewish day school where he mastered the language of the Torah. After graduating from high school, Chyet went to Israel where he also learned Arabic. Afterwards, he learned Turkish, Persian and eventually Kurdish. “Hebrew was a language that was dead as a spoken language for two thousand years,” he says, “but now it’s revived. Today Hebrew is a modern language with a huge publishing footprint. It’s a language of education, politics, science and all other fields. It’s a language that fits into the 21st century.” He is confident that Kurdish would be heading in that direction one day. Chyet, who has studied more than 35 languages, doesn’t understand why many activists and politicians who fight for Kurdish rights encourage others to preserve their Kurdish language, when it’s really ironic that most of them don’t speak Kurdish themselves, and if they do speak it, they don’t use it at home with their children. Let’s get to more juicy stuff about Michael and his love for Kurdî. Since there weren’t enough sources to learn Kurdish, it was really hard for him to find a book. “In the summer of 1985 I was in Turkey. While there, I decided to learn Kurdish. It was the next logical step, since I already spoke Hebrew, Arabic, Turkish and Persian. I looked for a Kurd who was interested in learning English, in turn he would teach me Kurdish. A colleague of mine found a waiter at a restaurant who was interested in doing that, so we would walk in the streets of old Istanbul and I would teach him some English, and he would teach me some Kurdish.” That was just the beginning. When he came back home, Chyet started to learn Kurdish by reading texts. There were folktales that had been published with side-by-side translation either in French or Russian. “There was very little in English, but I was glad that I knew German, French, Russian and Turkish, because there were lots of translations between Kurdish and these languages.” He tells me this with a smile. The fun thing about Michael is that he doesn’t shy away from the sword when it comes to discussing linguistic issues that many Kurds label as “sensitive.” You know exactly what I’m talking about here. Yes, Kurmanji and Sorani. Based on 20 years of experience with studying Kurdish, he acknowledges that differences between Sorani and Kurmanji, the main Kurdish dialects, become truly minor if one studies the two of them. However, no dialect should be imposed on the other, he says with authority. The following is a casual chat with Chyet on the latest. 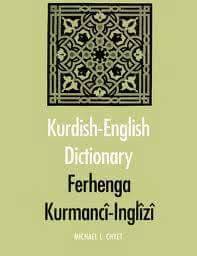 Zîv: You have been working on the second edition of your Kurdish-English dictionary. What’s the latest on that? MLC: I have been adding lots of words, and I have been improving the data in words that were in the first edition. It is a lot of work, and a labor of love for me, but I feel that I should be training a group of Kurds and Kurdologists to do what I do. It really is the sort of project that a team could do even more effectively, and there is no benefit in my knowledge dying with me — I should be training a cadre of teachers and lexicographers, shouldn’t I? There are lots of people active in politics, and hardly anyone taking an interest in studying Kurdish language and literature — and most (not all, thank gawd!) of the scholars are foreigners. We need more Kurds to take an interest in their own language and culture! I am looking for a new publisher for the second edition, as Yale University Press is not interested in publishing a second edition. Zîv: A number of prestigious institutions in the U.S. have recently launched Kurdish language programs. This clearly suggests that there’s a growing interest in Kurdish studies. As a Kurdologist, are you satisfied with the state of Kurdish studies in America and elsewhere? It is still largely the case that whoever wants to study Kurdish in this country (continent?) is sooner or later deposited on my doorstep. I am happy to teach Kurdish — both Kurmanji and Sorani — and to train students in the language and how to use the grammar correctly, and to be familiar with the standard Kurdish orthography in both Arabic and Latin script, including the one-to-one correspondence between the two. There are still too many Kurds who do not know these things. Does this new hire at Georgetown know these things? However, it is time for American universities to add Kurdish studies to their Middle East programs, including both Kurdish language, literature, and folklore on the one hand, and Kurdish history and politics on the other. I think it would be great if many people — hundreds or even thousands of people — would start asking Middle Eastern Studies departments around the country why they haven’t added Kurdish (both Kurmanji and Sorani) to their programs, alongside Arabic, Persian and Turkish! In the past, the Turkish government has tried to prevent this from happening here in the U.S., and American universities have been willing to coöperate with them. This is why I became the senior editor at the Kurdish Service of the Voice of America, and later a cataloger of Middle Eastern languages at the Library of Congress. My original ambition had been to establish Kurdish Studies in American universities, but the powers that be did not want that to happen back then. Although Kurdish was banned in Turkey until recently, my career has included two U.S. government positions, specifically because I know Kurdish. Zîv: Given what’s going on in Syrian Kurdistan, how do you foresee the future of Kurmanji Kudish. Kurdish in Rojava is turning into a sort of Lingua Franca. What positive effect, if any, can Syrian Kurds have on developing and promoting the language throughout Kurdistan? MLC: I’m glad you asked this, Sirwan! First of all, my motto (diruşma min) is: Zimanê ko zarok pê nepeyivin bê paşeroj e = A language not spoken by children has no future. If the Syrian Kurds are passing Kurmanji on to the next generation, that bodes very well for the future. Also, too many Kurds in Turkey have become lazy about speaking Kurdish and passing it on to the next generation, but since they don’t know Arabic and the Syrian Kurds don’t know Turkish, they are forced to speak to each other in Kurdish. So the presence of Syrian Kurds in Turkey and in Europe is like a dream come true, in that it is forcing the Kurds of Turkey to use Kurdish! Of course, the reasons that the Syrian Kurds have had to leave their homes are terrible, but this is definitely a positive side of the issue. Zîv: What else are you working on? I’m aware of your interest in collecting Kurdish riddles. Can you tell us more about it? MLC: My job at the Library of Congress is the ideal place to be able to collect riddles, proverbs, folk tales, and all other genres of folklore. Since I catalog all the incoming Kurdish books, I get to see all of the latest collections of folkloristic materials. I have been collecting both Kurdish and Arabic folk riddles for years now, and if I didn’t work at the Library of Congress, I would have been unaware of the existence of most of them. I plan to publish a corpus of Kurdish folk riddles (and a separate corpus of Arabic folk riddles), but I’m still collecting! In addition, I use folklore in language teaching. Each lesson begins with proverbs and riddles, which I have chosen because they illustrate (or exemplify) the grammar of that lesson. For example, when teaching the indefinite article –ek (meaning ‘a’ or ‘an’ as in ‘a man’ or ‘an apple’), the lesson begins with the proverb Dizî dizî ye, çi hêkek, çi gamêşek (Theft is theft, whether of an egg or of a buffalo). Posted in ART and tagged #Jews, #Kurdish, #Kurds, #languages, #Middleeast, #Turkey, #US, CULTURE. Bookmark the permalink. Hi Michael my name is Awara I’m from a city in Kurdistan called sleymani im sure you’ve heard of it! I would love to talk to you about my culture,my father speaks many different languages and is also a poet that’s been published back home plz contact me would love to discuss more!